On Tuesday, 6th December 2016. And I get to witness and record it all! Alhamdulillah... At first mum told me that Sofia held on to her finger to turn herself, but didn't manage to roll over. Later on Sofia did it again and managed to roll over! I was there watching and recording every moment. Awh... Such a proud moment! She tried about three to four times; once holding my finger, the rest holding mum's. She wouldn't rest until she got it! Mum said, "Selagi tak dapat selagi tu dia cuba". 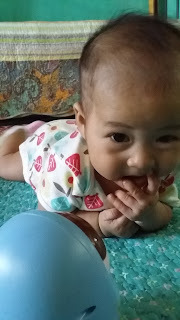 And I remembered those exact words came from her when she saw me practicing the frontcrawl arm drills while having a kickboard selit between my legs. Sofia's starting to show my traits... Eventhough she looked like her papa. I was just updating my husband when suddenly Sofia rolled over on her own! My mum and I were both watching her (me recording) struggling trying to turn over. Mum guessed she couldn't do it on her own yet. But we still cheered for her, though. Sofia pusing! Pusing! Kuat lagi! Alhamdulillah. Congratulations, Nur Khairah Sofia! On another note, Iz came home excited to see Sofia roll over as I've been sending him tons of pictures and videos of her. He stood in front of her waiting patiently, but she didn't even turn. She lay flat just like that. Hahah. When she finally rolled over, Iz was so overjoyed!